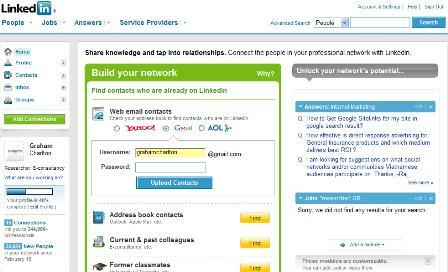 Professional social network LinkedIn has launched a series of changes to its homepage and added a new system of navigation. Drop-down menus are not normally my favourite method of website navigation as they can be fiddly, especially when the cursor moves away from the menu and you have to start over again. However, LinkedIn has at least kept the number of options to a minimum. The menu also stays on even when you move the cursor away, which makes it easier to use. Having launched a developer platform in December, LInkedIn has now added more widgets to the site. The platform is more limited than other social networks’, and new widgets need to match the ethos of the site. As well as the related news module on the homepage, a customisable widget on the right hand side displays LinkedIn Answers related to your industry, as well as potential contacts and jobs. Traffic to the professional network has been rising fast lately. LinkedIn currently has around 20m monthly users. Online advertisers! Stop shouting at me! There are a number of very irritating advertising techniques still used on the web today. Pop-ups, overlays and site intros are all highly annoying, but for me the worst ads are the ones that play sound as soon as you visit a web page. I seem to be noticing this a lot more recently, and it isn’t limited to low rent websites or brands. A bunch of well-respected sites regularly allow this, despite the fact that it makes visitors aim for the Back button. Getting a top organic ranking in Google can drive a huge amount of customers to a website, resulting in large profits. Break the rules and this traffic stream can be turned off overnight. According to figures quoted in The Guardian this week, ITV’s online video player has been losing traffic, while the BBC iPlayer has grown rapidly since its official launch last month.